Lyme disease is the most prevalent tick-borne disease in dogs according to surveillance in Ontario. Deer ticks may be carriers of Lyme bacteria Borrelia burgdorferi in our geographic area. 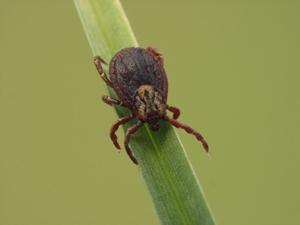 A carrier tick bites a human or dog and transmits Lyme bacteria through its saliva. Symptoms of Lyme disease in a person are different from those in dogs. Dogs do not get a bull’s eye rash the way that people do. A dog’s exposure to Lyme can be tested with a blood test. A cat’s exposure for Lyme is not screened, since cats do not get a clinical form of the disease. The majority of dogs that are exposed to Lyme bacteria do not develop symptoms, but a small number of dogs become ill and require treatment. In early stages (4-6 weeks after a bite) symptoms can include fever, decreased energy, swollen lymph nodes, decrease of appetite and limping. Dogs that get sick generally respond to a course of antibiotics – after treatment, they continue to harbor the infection without feeling ill. One possible long-term consequence of being infected with Lyme is glomerular kidney disease. In certain dogs, the production of antibodies to Lyme infection causes immune complexes to be deposited in the kidneys, leading to kidney damage over time. It has been recommended that Lyme positive dogs be regularly screened for significant protein loss in their urine. For dogs traveling to a high risk region for Lyme disease, there is a Lyme vaccine available. The purpose of the vaccine is to prevent infection in dogs vaccinated before any exposure to Lyme bacteria. At Coventry Animal Hospital, we strongly recommend using tick prevention, even for dogs that are vaccinated. 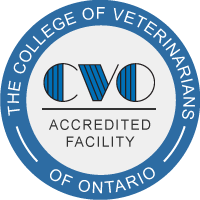 © 2019 Veterinarians Stratford | Coventry Animal Hospital.